Are you losing listings to your competition? Let’s get real, real estate agents: listing presentations will make or break you. Can you build a rapport fast with the home seller? Can you quickly communicate what makes you unique? Or do you give a one-hour, one-way lecture all while hyperventilating and sweating through your outfit? While you’re drying off, do yourself a favor and read on to learn about these five common mistakes you must avoid in your listing presentation. If you can dodge these rookie moves, you’ll master the art of the listing presentation and score more listings, closings, and happy clients. 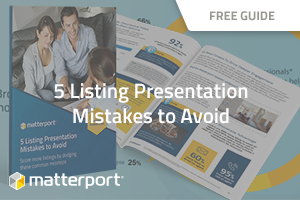 Download our ebook to learn what mistakes to avoid in your next listing presentation. If you can dodge these rookie moves, you’ll master the art of the listing presentation and score more listings, closings, and happy clients.